Passenger car after snow storm. 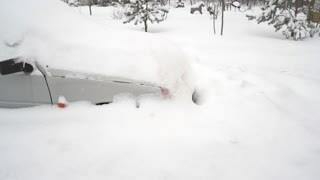 Car buried under deep snow after snow storm. How cold temperatures affect your car. Saying no is not always easy because this answer might affect someone we care about. Woman paint with colored brush. Games with children affect the development of early children. 1960s - Through tests conducted by the Atomic Energy Commission it is determined that irradiation does not negatively affect strawberries and fruit. Convention in Las Vegas Nevada. National Association of Broadcasters annual meeting and product display and marketing. People in the industry in blur for good camera affect. Don Despain of Rekindle Photo. 1930s: UNITED STATES: weight of air experiment with can. Affect of air pressure on can. Collapsed metal container. Man picks up damaged can. Brexit logo animated video concept with flag and title. Background London bridge view with ships on river Thames, while brexit and how will it affect uk titles are superimposed above British flag. Drone hovering over waves on a San Diego beach. The Waves are flowing in and out creating a soap affect. Nice student in virtual reality headset sitting at table and touching something in air. Lifestyle. Modern technology. Fabulous young Caucasian man wearing virtual reality headset waving hands in air. Portrait of focused nice Slavic guy using modern device. Indoors. Lifestyle. An educational film which shows students how glands affect our emotions, in 195 and a polygraph test. A scientist shows an uncle-in-law and his nephew-in-law diagrams about how a yeast diet can affect the human colon at a laboratory. 1968 - An animated segment shows how the moon's orbit around the Earth and the latitudes of the moon orbit plane can affect when and how a spacecraft would land there. 1942 - Animation is used to show how the most common chemicals used in chemical warfare affect the human body. 1985 - An entomologist explains how cold weather might affect Africanized bees in the US. 1985 - An entomologist considers how African bees' pollination might affect American crops. 1960 - Animation is used to show how faulty plugs and magnetos can affect helicopter vibrations. 1964 - In a campaign speech, Barry Goldwater shares his concerns about how inflation will affect social security. 1954 - Animation is used to show how wind patterns could affect the path of nuclear fall-out particles. Polystyrene found on a beach. Plastic in the ocean. Plastic causing negative affect on marine life. Close up from above of the River Otter with its lushes greenery and nature. The south stream hold many trout fish in it. Global change could affect the wildlife at this location. Likable guy in virtual reality glasses, looking around, fighting on background of pink wall. Young attractive African man under impression looking at camera. Shiny white smile. Close-up. Nice African guy in mint sweater putting virtual reality glasses, looking around. Young impressed handsome man looking down, up, smiling. Visual effects. Pink wall.